Many commentators have recognised the limitations and inapplicability of the traditional quantitative pyramid hierarchy especially with respect to complementary and alternative (CAM) health care, observing the way Evidence-based Practice [EBP] is sometimes implemented is controversial, not only within the chiropractic profession, but in all other healthcare disciplines, including medicine itself. 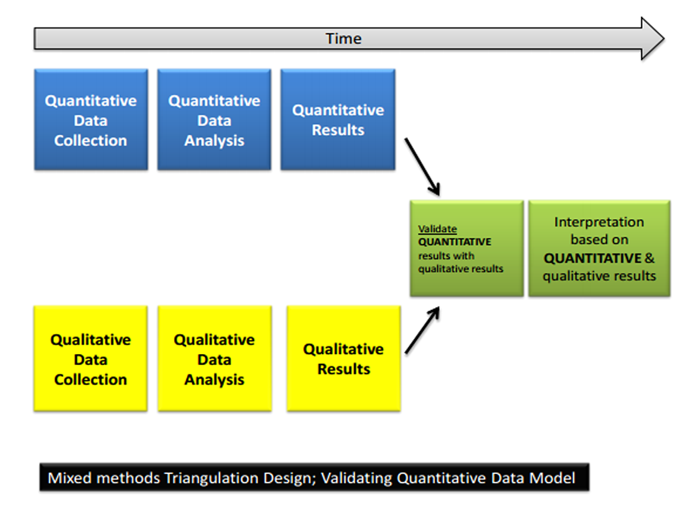 A phased approach to the development and evaluation of complex interventions can help researchers define the research process and complex interventions may require use of both qualitative and quantitative methods. The chiropractic profession has little to fear from evidence-based practice; in fact it should be used productively to improve patient care, clinical outcomes and the standing of the profession in the eyes of the public, other health professions and legislators. Scientists in all the health care disciplines recognise that clinical encounters are composed of a kaleidoscope of constituent parts, which are able to act both independently and interdependently. These include client/patient behaviours, goals and expectations, and practitioner characteristics as well as locale, demographics, and personality; of both patients and clinicians. [19, 20] All these criteria are certainly characteristic of chiropractic practice. “… a method, that focuses on collecting, analysing and mixing both quantitative and qualitative data in a single study or series of studies. 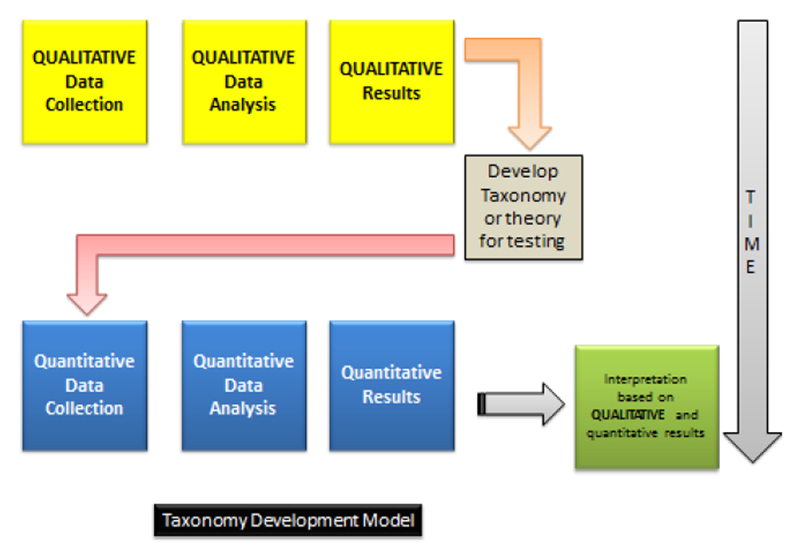 Its central premise is that the use of quantitative and qualitative approaches in combination provides a better understanding of research problems than either approach alone (45, p5)”. The aim of this paper was to identify various mixed methods models of research design and discuss their applicability to complex and sophisticated research in the complementary and alternative space, particularly chiropractic and manipulative. 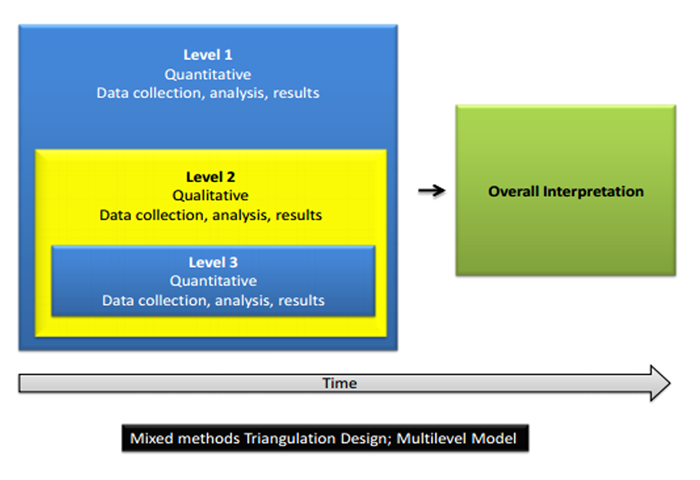 Various designs of mixed-methods design were identified broadly fitting four major types according to a typology described by Creswell and Plano-Clarke. Note: examples are presented as representing study design and no evaluation is made of study quality. Abstracts are sometime quoted verbatim where indicated. 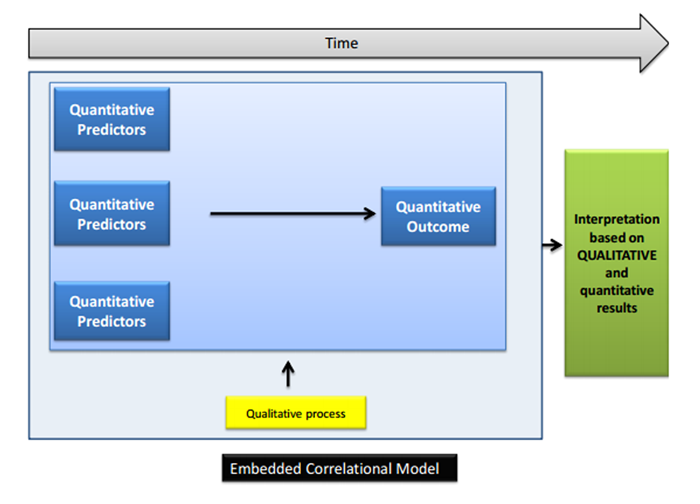 The embedded design, is characterised by having one dominant method, whereas the other data set provides a secondary or supportive role where priority is given to the quantitative methodology, and the qualitative data set is subservient. 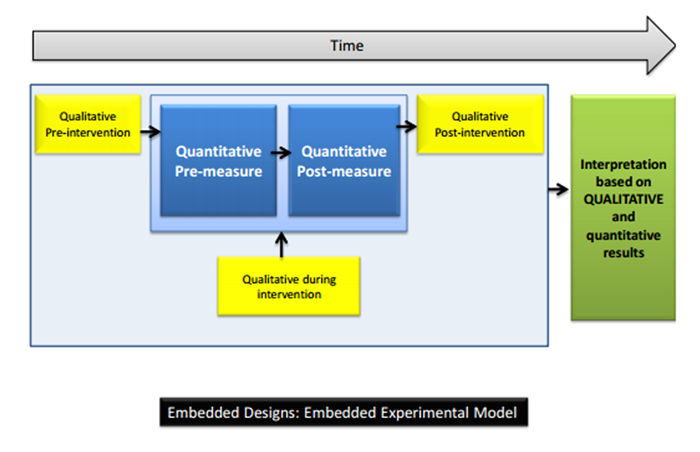 Experimental Embedded Design is the most commonly used variant of the embedded design and has qualitative data embedded within an experimental design (such as a true experiment or a quasi-experimental design) and the qualitative data set is subservient within that methodology. 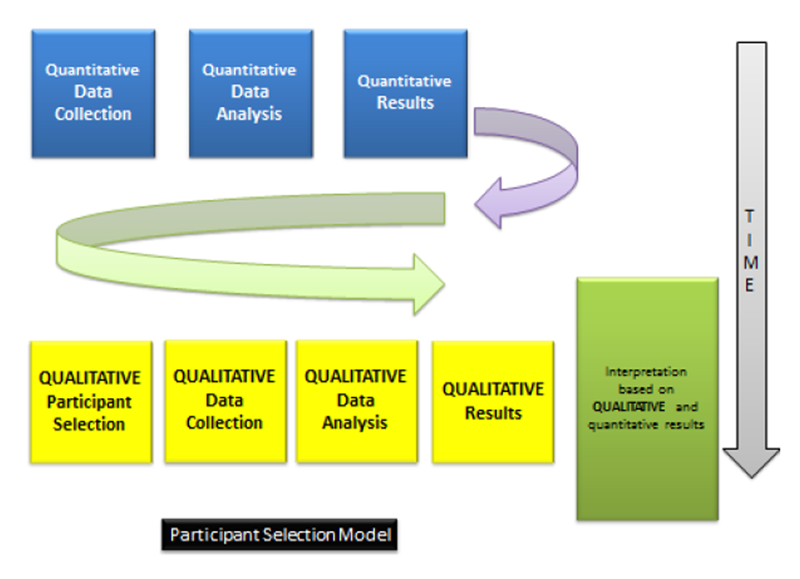 A variant is the ‘Correlational Embedded Design’ where researchers collect qualitative data as part of their study (Figures 2 a-c). 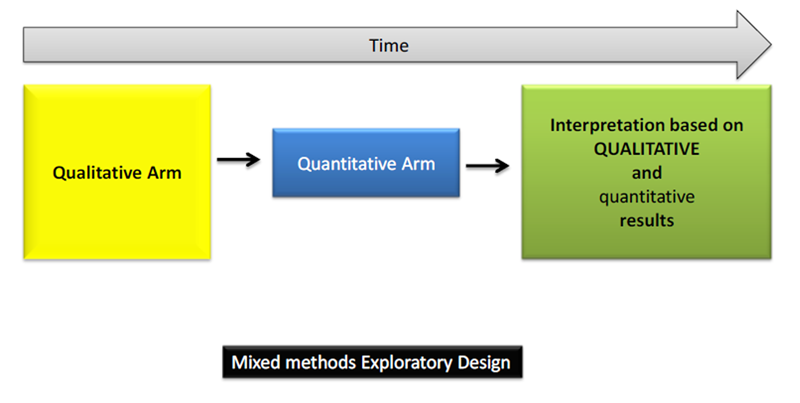 The exploratory design is a sequential design where the first phase, qualitative, helps in the development of the quantitative phase. 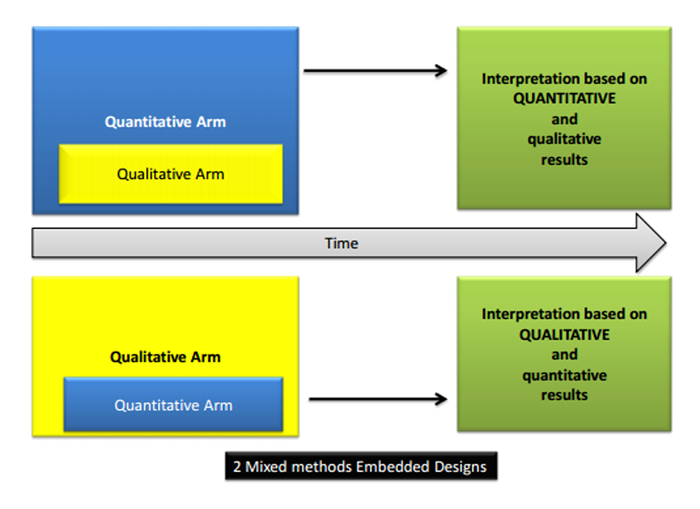 These are two phase studies with the intent of using results of the first method (qualitative) to help develop or inform the second method (quantitative), based on premise that an exploration is needed – for, for example: measures or instruments are not available, the variables are unknown or there is no guiding framework or theory. 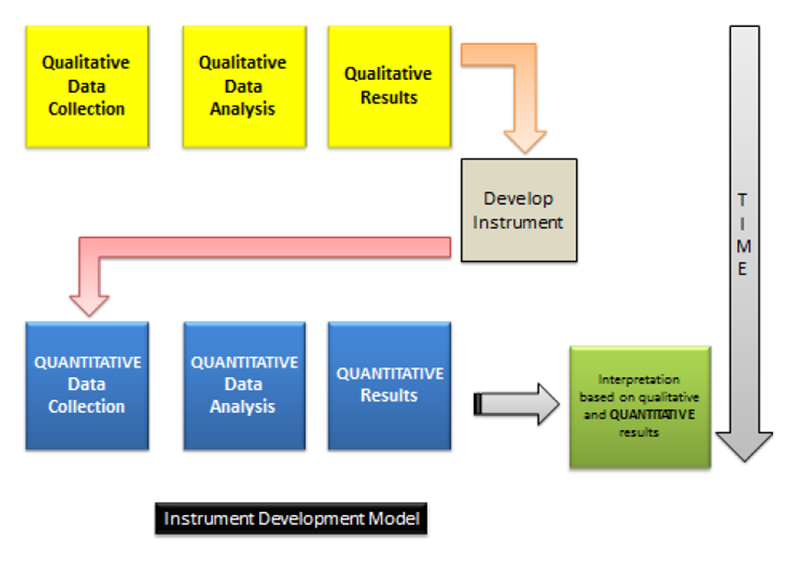 Applications include; Instrument Development Model, Taxonomy Development Model (Figures 4 a-c). As the debate regarding the application of EBP in chiropractic continues, it is perhaps timely to reflect that if health care were to ubiquitously hold all treatments and interventions for any condition, in any profession, to ‘Level 1’ or high level evidence [or recommendation level ‘A’], that is in effect a proposal to revert most of healthcare back to the dark ages. Those who criticise the (lack of) scientific (RCT) basis of chiropractic would do well to reflect on the absence of (RCT) clinical trials of, for example; dental root canals and spinal surgery. Chiropractic scientists are indeed rising to the challenge. Those who doubt the disproportionate influence of chiropractic researchers may have been somewhat surprised when The Spine Journal announced its "Top 25 Hottest Articles"; the most downloaded articles for 2011. Thirteen of the 25 articles have at least 1 author who was a chiropractor. In addition, 10 of the 25 include content relating to spinal manipulation or chiropractic,; 6 of which included the terms in their title. A positive spin-off of evidence-based practice is that it can influence the evolution of the chiropractic profession by challenging many traditional practices, it questions use of interventions that are merely the preference of the practitioner and it helps evaluate the role of chiropractic within a contemporary healthcare landscape. As with all healthcare disciplines, the goal is to improve by, if necessary, adopting new ways of doing things and to set aside those practices that clearly are not effective or in the best interest of patient subgroups. Landmark recent publications have built on evolving knowledge over the last decade to provide all health practitioners with guidance on how they can design and evaluate complex studies. [19, 85, 86] Chiropractic scientists have embraced this trend and this paper argues that the chiropractic profession should adopt such thinking more widely. The examples presented in this series illustrate, what can be achieved by relatively few dedicated chiropractic research scientists with meagre resources. Complex challenges and limited funding are not, therefore, a reason to avoid sophisticated research. In fact, the complexity of chiropractic care and the ubiquitous lack of financial resources, make it even more important to use rigorous methods to conduct research. This series of papers has attempted to illustrate that a major objection to sophisticated research in chiropractic – that chiropractic is too complex to be studied, can be overcome by careful attention to methodology and detail; and utilisation of appropriate design. It is emphasised that the strength of inventive chiropractic research in the authors’ opinion lies in the combination of both qualitative and quantitative research, and in the gathering, replication and application of research findings in the ‘real world’ of clinical practice. Analyzing long-term outcomes of clinical care without randomized controlled clinical trials: the consecutive patient questionnaire database. Yue Q, Bergquist C, Gerden B. Safety of St. John's wort. Evaluating complementary and alternative medicine: the balance of rigor and relevance. In: Jonas WB, Levin JS, eds. Walach H, Falkenberg T, Fonnebo V, Lewith G, Jonas W.
Circular instead of hierarchical: methodological principles for the evaluation of complex interventions. Shadish WRJ., Cokk TD., Leviton LC., editors. Evaluating complementary medicine: Lessons to be learned from evaluation research. In: Lewith G, Jonas WB, Walach H., editors. In Clinical research in complementary therapies: principles, problems, and solutions. Leboeuf-Yde C, Lanlo O, Walker B. Is Required But Very Little Evidence Available? Martel J, Dugas C, Dubois J-D, Descarreaux M.
Hancock MJ., Maher CG., Latimer J., McAuley JH. Selecting an appropriate placebo for a trial of spinal manipulative therapy. Kawchuk GN, Haugen R, Fritz J.
Hawk C, Long CR, Reiter R, Davis CS, Cambron JA, Evans R.
RCTs in complex nursing interventions and laboratory experimental studies. Gaps between best evidence and practice: causes for concern. 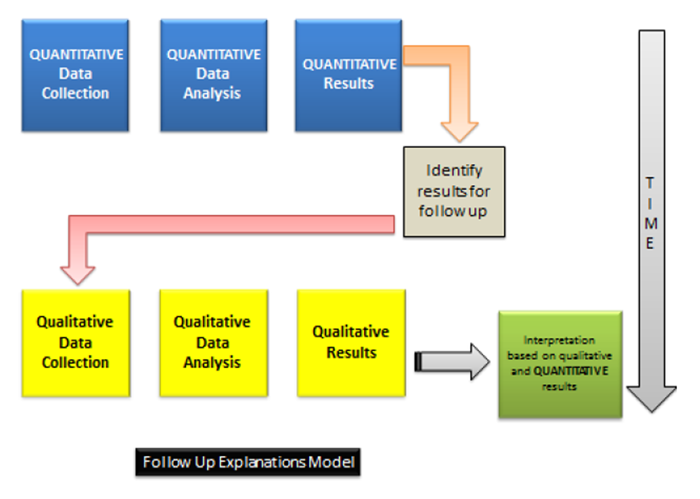 A Framework for development and evaluation of RCTs for complex interventions to improve health. Back pain amongst 8,910 young Australian women: a longitudinal analysis of the use of conventional providers, complementary and alternative medicine (CAM) practitioners and self-prescribed CAM. Complementary and alternative medicine use in Australia: A national population-based study. Spinal pain model of care. Western Australia Perth, Western Australia: Health WA; 2009 [27th June 2015]. Koes B, van Tulder M, Ostelo R, Burton A, Waddell G.
Koes B, van Tulder M, Lin C, Macedo L, McAuley J, Maher C.
Barriers and progress in the treatment of low back pain. Concato J., Shah N., Horwitz RI. Personalizing medicine: a systems biology perspective. Pharmaceutical Research and Manufacturers of America. Kaplan BJ., Giesbrecht G, Shannon S, McLeod K.
Evaluating treatments in health care: The instability of a one-legged stool. Evidence-based medicine: Revisiting the pyramid of priorities. West SG, Duan N, Peguegnat W, Gaist P, Des Jarais DC, Holtgrave D, et al. Alternatives to the randomized controlled trial. Tunis SR, Stryer DB, Clancy CM. Hawk C, Khorsan R, Lisi AJ, Ferrance RJ, Evans MW. Making evidence-based medicine doable in everyday practice. Ritenbaugh C., Aickin M., Bradley R., Caspi O., Grimsgaard S., Musial F.
Whole systems research becomes real: new results and next steps. Guastello S, Koopmans, M., Pincus, D. (eds)., . Verhoef M., Lewith G., Ritenbaugh C., Thomas K., Boon H., Fønnebø V.
Whole systems research: moving forward. Avins A, Cherkin D, Sherman K, Goldberg H, Pressman A.
Explanatory and pragmatic attitudes in therapeutical trials. Campbell M., Fitzpatrick R., Haines A., Kinmonth AL. Framework for design and evaluation of complex interventions. Do RCTs provide the answer? The current state of play for musculoskeletal conditions and what is on the horizon. Creswell J, Plano Clark V.
Designing and conducting mixed methods research. Creswell JW, Plano Clark VL. The nature of mixed methods research. designing and conducting mixed methods research. 2nd ed. Mixed methods studies: a foundation for primary care research. 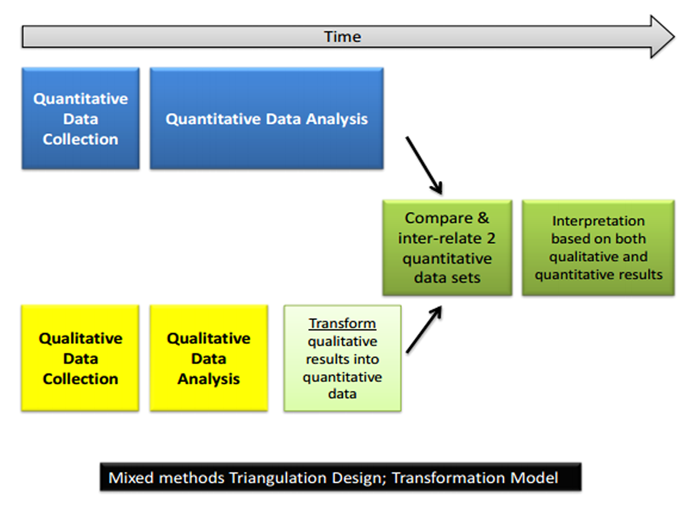 Paradigms lost and pragmatism regained: methodological implications of combining qualitative and quantitative methods. 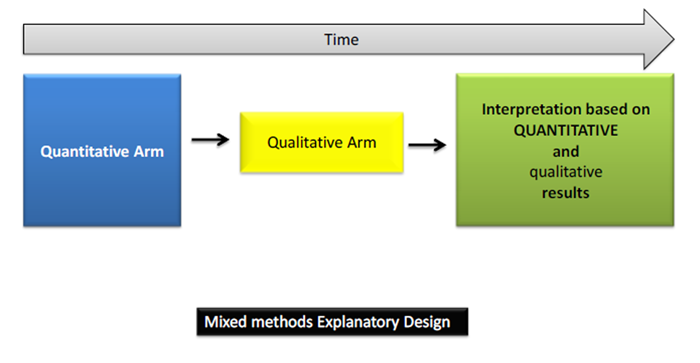 Mixed methods research: a research paradigm whose time has come. 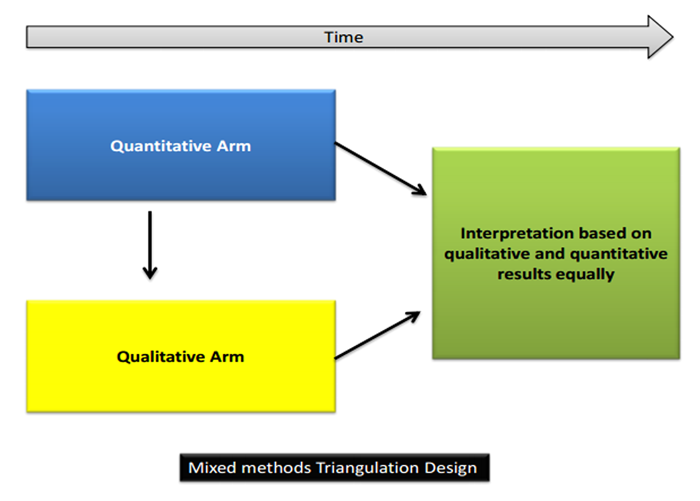 Research design: qualitative, quantitative and mixed methods approaches. Doyle L, Brady A-M, Byrne G.
An overview of mixed methods research. Kopansky-Giles D, Peranson J, Reeves S. P05.68. Teaching an interprofessional approach to the management of musculoskeletal problems in primary care - a pilot study. Corbett M, Foster N, Ong BN. GP attitudes and self-reported behaviour in primary care consultations for low back pain. Ritenbaugh C, Nichter M, Nichter M, Kelly K, Sims C, Bell I, et al. Developing a patient-centered outcome measure for complementary and alternative medicine therapies I: defining content and format. Are chiropractors in the uk primary healthcare or primary contact practitioners? : a mixed methods study. Problems in the "evidence" of "evidence-based medicine". The problem of evidence-based medicine: directions for social science. Engineering quality in health care. Complexity and uniqueness in nursing practice: Commentary on Richards and Hamers. The chiropractic care of children: an open response to Chiropractic & Manual Therapy’s thematic series on pediatric chiropractic. Armstrong MP., McDonough S., Baxter GD. Clinical guidelines versus clinical practice in the management of low back pain. Di Iorio D., Henley E., Doughty A.
Scott NA., Moga C., Harstall C.
Managing low back pain in the primary care setting: The know-do gap. Adherence to clinical practice guidelines among three primary contact professions: a best evidence synthesis of the literature for the management of acute and subacute low back pain. Making research relevant: if it is an evidence-based practice, where's the practice-based evidence? Parkin-Smith G, Amorin-Woods L, Davies S, Losco B, Adams J.
Spinal pain: current understanding, trends, and the future of care. Transforming health care through the use of evidence-based practice. European guidelines for the management of low back pain. Dunning JR., Cleland JA., Waldrop M, Arnot C, Young I, Turner M, et al. Upper cervical and upper thoracic thrust manipulation versus non-thrust mobilization in patients with mechanical neck pain: a multi-center randomized clinical trial. Dunning JR, Butts R, Mourad F, Young I, Fernandez-de-las Peñas C, Hagins M, et al. Guyatt G., Sackett D., Cook D.
User's guide to the medical literature: II. How to use an article about therapy. Evaluating the relevance, generalization, and applicability of research. Rubinstein SM, Terwee CB, de Boer MR, van Tulder MW. Is the methodological quality of trials on spinal manipulative therapy for low-back pain improving? Bonetti D, Eccles M, Johnston M, Steen M, Grimshaw J, Baker R, et al. Guiding the design and selection of interventions to influence the implementation of evidence-based practice: an experimental simulation of a complex intervention trial. Shiell A., Hawe P., Gold L.
Complex interventions or complex systems? Implications for health economic evaluation. Amorin-Woods L., Parkin-Smith G., Cascioli V., Kennedy D., editors. The Palmerston-Murdoch Pilot Project; P-MPP”. Amorin-Woods L, Parkin-Smith G, Cascioli V, Kennedy D.
Manual care of residents with spinal pain within a therapeutic community. Helping address the national research and research capacity needs of Australian chiropractic: introducing the Australian Chiropractic Research Network (ACORN) project. The Spine Journal 25 Hottest Articles January to December 2011 2012 (June). Authentic Knowing: The convergence of science and spiritual aspiration. Designing and evaluating complex interventions to improve health care. Developing and evaluating complex interventions: the new Medical Research Council guidance.